Love using your curling wand? 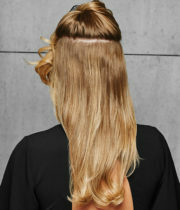 Pop in this 1 piece extension to add length that’s pre-styled to match. Tru2Life® heat-friendly synthetic hair means touch ups are optional. No magic wand needed to get these extensions to match your favorite hairstyle. Just clip in and go!